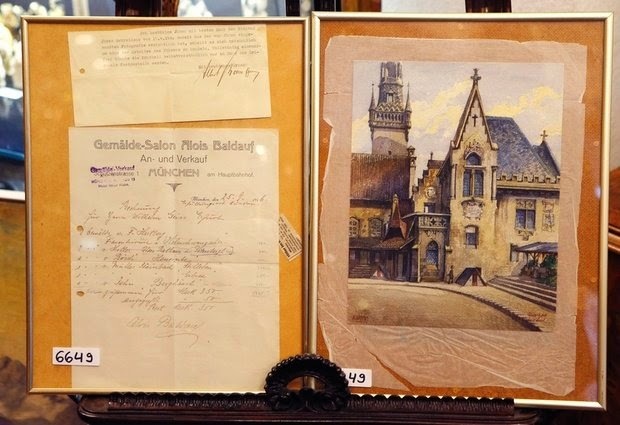 BERLIN, GERMANY (ASSOCIATED PRESS) — A watercolor of Munich's old city hall believed to have been painted by Adolf Hitler a century ago was sold for 130,000 euros ($162,000) at an auction in Germany on Saturday. Kathrin Weidler, director of the Weider auction house in Nuremberg, said the work attracted bidders from four continents and went to a buyer from the Middle East. She declined to elaborate. The auction house says the painting is one some 2,000 by Hitler and is thought to be from about 1914, when he was struggling to make a living as an artist, almost two decades before rising to power as the Nazi dictator. The painting, which had been expected to fetch at least 50,000 euros, was sold by a pair of elderly sisters whose grandfather purchased it in 1916. Hitler's paintings surface regularly, but the auction house said the 28-by-22 centimeter (11-by-8.5 inch) scene auctioned Saturday also includes the original bill of sale and a signed letter from Hitler's adjutant, Albert Bormann, brother of the dictator's private secretary Martin Bormann. From the text of the undated Bormann letter, it appears the Nazi-era owner sent a photo of the painting to Hitler's office asking about its provenance. Bormann wrote that it appears to be "one of the works of the Fuehrer."